As Fall and winter approach, it is time to check your snow blower. Doing maintenance in warm weather is far easier than after the snow falls and it has gotten really cold. The worst case is that you have lots of snow to clear and your snow blower will not start. Check snowblower spark plug when it is warm and easy to do the work. What is the difference between a spark plug in good condition and one that is not? The picture shows a new spark plug and one that is covered in soot. It also has some corrosion as well. A badly corroded spark plug that is covered in soot indicates and engine that will be hard to start and running roughly. Replaced it now with a new spark plug and eliminate that potential problem. Begin by removing the spark plug wire from the end of the spark plug. Remove any dirt that may have accumulated around the spark plug. Use a spark plug removal socket to remove the spark plug. 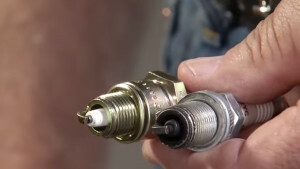 Examine the spark plug for corrosion and / or soot build up. If it does not look too bad, you can clean it up, re gap the electrode and reinstall the plug. Use fine sand paper to remove the soot and to also remove any corrosion from the tip of the plug. If in doubt just replace it. In both cases, set the proper gap for the plug before reinstalling the plug. Use a gap setting tool to adjust the gap between the two electrodes. Check in the manual for the proper setting. Remember even a new spark plug must have the electrode gap set properly before installation. Reinstall the spark plug, reconnect the spark plug wire and start the engine. If you have done the job properly, your engine should start easily and run smoothly. If not you may also need to check the carburetor as well.